Movie Review: This 71-minute small-scale Polish documentary, directed by the Portuguese, Miguel Gaudêncio, superficially gazes at feminine boxing in Poland. 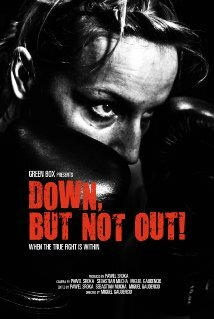 The director follows a team of four boxers and their trainer during 24 hours. Evincing pictorial qualities in its well-calibrated black-and-white images, “Down But Not Out!” doesn’t find much depth in the characters, failing to establish any exciting connection between the viewers and the protagonists. The film presents too much of unexciting fights, and too little about the brave Daria, Anna, Agnieszka, and Alicja, who keep being motivated by their talkative coach, Przemyslaw. The team spends one night in a small motel in the city of Poznan, where the next day they’re going to participate in a tournament. The pic deviates our attention from the women by also presenting men’s fights, more muscled and intense, but irrelevant to the story. After stepping into the ring for the first time, each pugilist shows more or less anxiety and eagerness to prove what they worth. But for me, these natural reactions weren’t enough to shape them accordingly because I still wanted to know more about their lives and personalities. There's a moment of frustration when an opponent decides not to fight Agnieszka due to health reasons, which is not particularly strong. An interesting aspect is when she makes reference to the diets and all the efforts put through, so they can be sufficiently prepared to compete. The combats are adorned with an often-intrusive synth score that projects the film more into a video clip rather than a real study. Boxing is not one my favorite sports, however, that fact wasn’t the motive for my detachment. I’ve found little substance here, and the only explanation is that Mr. Gaudêncio doesn’t have much of a story to consolidate his nice images.